DFSNs classified 10 Village Development Committees (VDCs) in Sindhupalchowk as severely food insecure (Phase 4)with an estimated 28,700 affected people. This situation was attributed to the 25 April earthquake and subsequent aftershocks,including the biggest one on 12 May. DFSNs classified an additional 224 VDCs in 11 districts as highly food insecure (Phase 3) with an estimated 500,300 affected people. DFSNs classified another 329 VDCs in 23 districts as moderately food insecure (Phase 2) and the other 3,360 VDCs and municipalities as minimally food insecure (Phase 1). 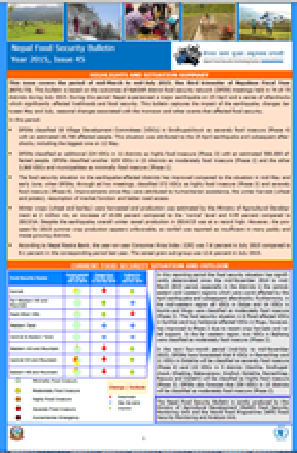 The food security situation in the earthquake-affected districts has improved compared to the situation in mid-May and early June, when DFSNs, through ad hoc meetings, classified 372 VDCs as highly food insecure (Phase 3) and severely food insecure (Phase 4). Improvements since May were attributed to humanitarian assistance, the winter harvest (wheat and potato), resumption of market function and better road access.